Welcome to the Imbolc Blog Hop. Our fearless wrangler, Morgan Drake Eckstein, has tasked us to come up with the oddest associations we have for tarot cards. When I first read this topic, I had no clue what I was going to write about, but then I started realizing that some of my associations aren't quite normal so here goes. Once upon a time there was a sad and pathetic little pagan who had just been dumped by her husband of 22 years. Desperate for some kind of help and to cheap to hire a therapist, she turned to tarot. As she started playing with--and accumulating--decks, she realized that there were certain cards that she had an absolutely visceral reaction to that didn't match the explanation in the little white books that came with her cards. Undaunted, she kept exploring and soon came to realize that the meanings in the little white books were mere suggestions and not dogma. Eventually, as she healed and acquired more decks and did more readings, she found that some of her definitions had been "found" by other people, but others were uniquely hers. And more importantly, she realized that was okay. The six of pentacles is a card of balance and it is a card about opening your heart to give and to receive. 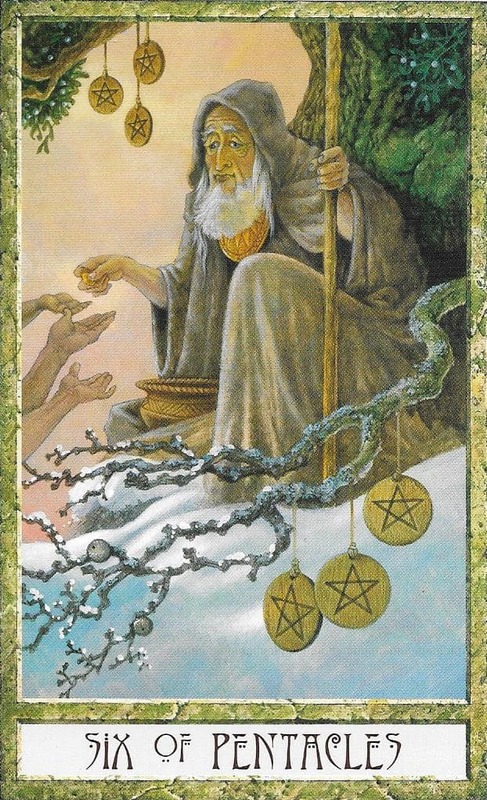 However, the first six of pentacles image that I saw was from the DruidCraft tarot and my gut reaction to this card was that the gentleman was being asked to give everything he had. In hind site, I realize that this reading was a reaction to where I was in my life. I had been raised to believe that women were to sacrifice everything for their loved ones and keep nothing back for themselves. This also perfectly described my marriage where I was expected to give everything and my husband gave nothing. While I still don't like the image on the DruidCraft Tarot, as I've grown and matured and explored a lot more decks, I've come to realize that the card truly is about both giving and receiving. It is about receiving gracefully and not giving more than you have to give. 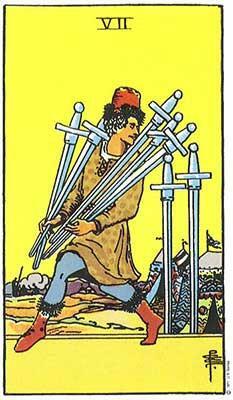 Another card that gives me a visceral reaction is the six of cups in the RWS deck. While the little white book says this card is about childhood memories, happiness, joy, and new opportunities, this card has always struck me as a little bit creepy. It feels as if the older boy us luring the young girl somewhere with the flowers. Just like with the six of pentacles, there is a clear imbalance of power here and when I first started reading tarot, I would cringe when I pulled this card. However, I've started to see the more positive aspects of this card as I've started to realize that if the person with the power behaves with respect, the imbalance of power can be a positive experience for both parties. While the six of cups is a traditionally positive card that I put a dark spin on, the four of cups is a more negative card that I put a more positive spin on. I have always viewed this card as refusing something that I don't need or that is not in my best interests. To me, it is all about someone shoving something down my throat and not taking no for an answer. As I've dug into my past and started to explore how my worldview got so F*ed up, I've realized that this is another perception that goes back to my young adulthood. When I was first starting out and I wanted nice things, my extended family members would buy junk from garage sales and expect me to be grateful and happy with it. My mother expected me to take it no matter what it was even if I was seething inside. If I tried to politely decline, I was labeled as ungrateful. 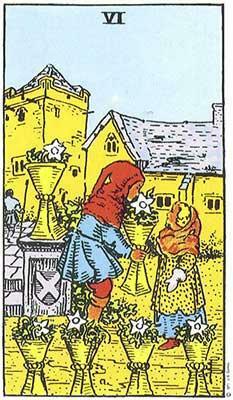 So for me, the four of cups is me crossing my arms while my relatives try to shove garbage into my hands. What I've come to realize as I've acquired more decks (some would say too many) and deepened my understanding of Tarot, I've come across some sources whose meanings for the above cards are similar to mine. I've also realized how deeply personal Tarot truly is and that the meanings are depending on the deck, the situation, and the person doing the reading. For some more Odd Tarot Associates, hop backward to Arwen's Blog or ahead to Joy's Blog by using the links below. I love your interpretations--makes me think about the deeper meanings of some of the cards that we all seem to think mean the same thing all the time. Nice work! 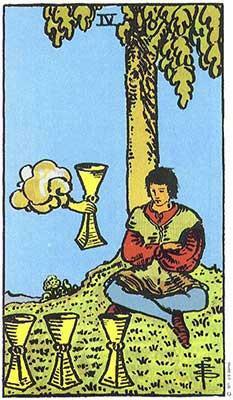 Ohhh loved reading your interpretations, especially the one about the six of cups! Love hearing about how other readers connect to the Tarot. Each of us is sooo unique! I think personal meanings can be very helpful -- first, if you're reading for yourself, then yes! : that is the meaning for you. But who's to say that others that you read for wouldn't resonate more with a passionately experienced interpretation than some haphazard words from a freebie book stuffed in with the deck? Great insights! I think seeing how your own worldview plays into your interpretations is very wise.